Since we’re heading into the second half of June, I thought it was time to catch you up to date on this year’s hay bale garden. In all actuality it’s a wheat straw bale and not hay. In typical “hay” bales the grasses are much too tough and will not deteriorate down for growing medium like wheat straw will. If you missed the procedure in previous posts – and would like to start your very own wheat straw garden – you can find the complete procedure HERE. At the end of last year’s project, we had created about 10 good bushels of composted wheat straw which got worked back into the ground this year for a couple of ground raised beds and weed control. Beans and Crucifers (kales and cabbages) don’t tolerate the looser soil of the bales and aren’t a very good candidate for the bale garden. We created two raised beds to accommodate Dutch Flat Cabbage, French Cone Cabbage, Brussels Sprouts, Rhubarb Chard, and Bush Limas – which are all thriving well in the moist real estate next to the downspouts. With the success of last year’s Gray Zucchini, we’ve added only 2 plants this year. So far, we’ve got 9 on the vines and a good 12 or so more in the juvenile stages. The Patty-Pan Squash is another story. Last year was a dismal failure. On 4 plants, I had only 2 squash mature. Unlike most professionals who feel that they are watery and tasteless, I love patty-pan squash. The flavor is light, but it is such a distinct flavor, that no other squash compares to it. 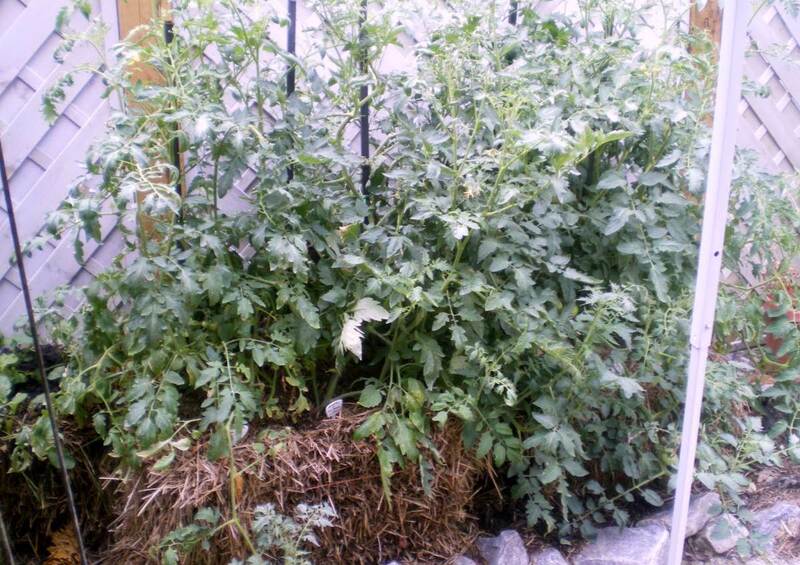 Since I was determined to have my very own this year… I planted 12 plants…. they’re all producing. I’m going to have a bumper crop of patty-pans. In addition, they’re making HUGE squash. The squash on the left is standard sized squash (about 2.5 to 3″ in diameter). The monster squash on the right is 8″ across and 5″ thick! I have never seen one that size before. I’m very pleased. In addition to the obvious fruits, we’ve got a vast supply of blossoms that will make for some mighty fine Squash Blossom Rellenos in a couple of weeks. The old stand-bys are all doing better this year. We have a good stand of Cilantro and Curly Parsley, and the Mint and Oregano need very little tending. I’ve moved the Lavender, Rosemary and Purple Basil to the front gardens to fill in some areas where the deer are devastating the beds. (Each of these are deer resistant and somewhat of a deterrent for them). The problem is the Fennel. 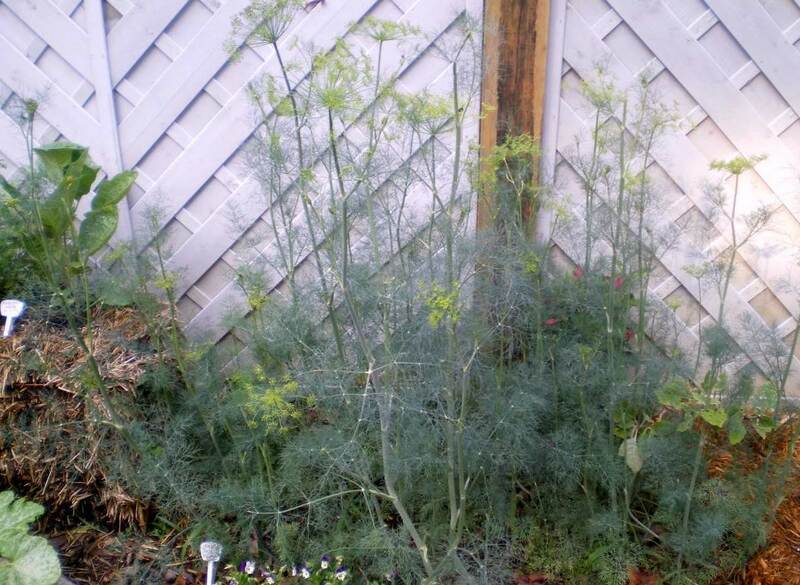 It isn’t fennel – it’s Mammoth Dill. The seed pack said these were supposed to be Florence Fennel, which if you’re buying bulbs at the market, it’s probably what you are getting – large, heavy ridged white bulbs with a profusion of fragrant, dark green fronds. I was sorely disappointed. Now… I like dill and I use it a lot. But, I don’t think I need 15 plants of the monster stuff. I’ve decided to let the stems bolt and collect as much of the pollen as I can. I know from my own buying excursions, the pollen can be a bit pricey – and the pollen will allow me to capture that fresh dill flavor long after the season is over. You know from earlier posts, I’ve expanded the tomato patch. From three varieties last year, we increased the section to 6 varieties (all heirlooms) …and 2 plants of each. It has turned into a jungle. The patch should triple in size by the time all the plants are producing. I’m particularly excited about seeing the Mortgage Lifters – they’re supposed to be 6 to 8″ across! Sadly, all of the root vegetables have been a big fat fail. Out of 12 Beets – only 3 have survived, and only one is producing a bulb. The Radishes (all 5 varieties) have produced nothing but tops. I’ve already scrapped those beds and harvested the greens. 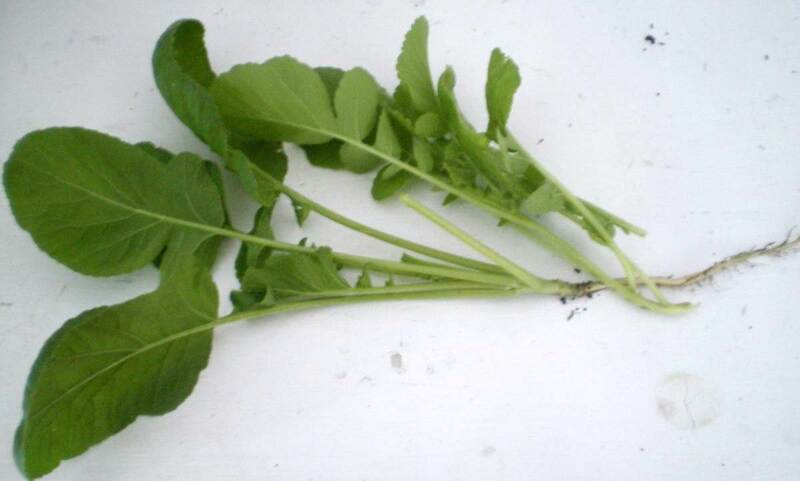 Radish greens are similar to mustard greens – slightly peppery – and cook up fairly well as you would cook up a mess of turnip greens. 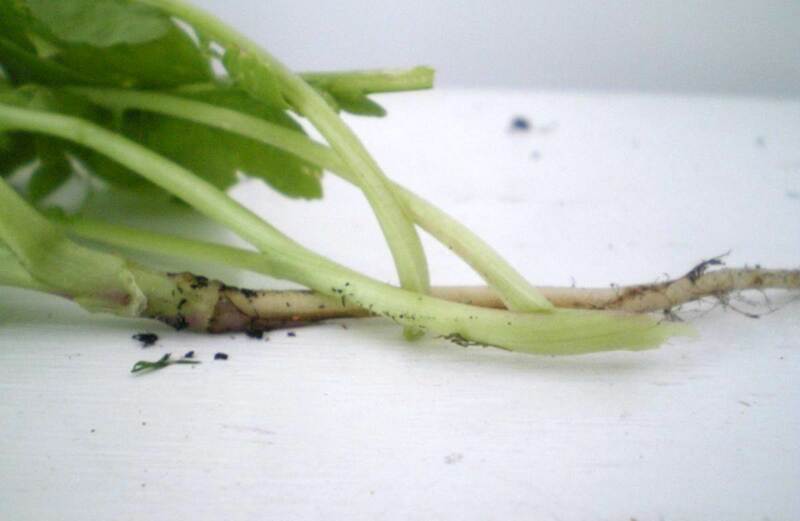 Carrots – It’s too early to tell, but I fear that they are going to meet the same fate as the radishes. 4 Varieties have only yielded 6 plants. I have augmented the carrot bales with Long Sweet Peppers and Neon Eggplant which are both doing well. Okay, it’s no secret, you know I’m an okra man. With last year’s 4 plants we netted about a mess of okra every 8 days. This year I have 14 plants. With the anticipated 3 pods per plant every 2 days, I should be up to my … neck.. with okra once we are in full production. I’m a happy man. We’re trying out a couple of new crops in some of the failed areas. The Early English Peas did OK, we got one “good” mess from them. If we do them again, I’ll probably start them out much earlier than the other plantings. We’ve started 2 strains of Hybrid Cucumbers to see how they do in bales – A Hybrid Pickling which looks a little like an over-sized gherkin, and a hotter climate English. We’ll see how they do. Peppers – I’ve never been terribly successful at growing poblano peppers – I usually get more plant than produce. We’ve got an area that did fairly well with green chilies last year, so this time I’m trying it out with some more robust peppers. That’s it for now. Look for me to tackle that monster squash this next week. Nanjing Jieyang Machinery straw making machines is a professional Drinking Straw Production Machines manufacturer, which integrates R&D, production, sales and service, with customer first folding spoons as the philosophy of its service. In the pursuit of continuous improvement and development, it endeavors to provide more refined products and more considerate service to its existing and newly-developed customers. @Lo-moCheck with your local nursery – but – I've read that there are 3 different varieties that are cold tolerant. Clemson Spineless "says" that it will grow in 5B but I havent seen anything giving that any validity. You can try to nudge things along by1.) Pre soak the seeds for 48 hours before planting2.) Start the seeds inside so they will stand a better chance of getting a head start on the growing season.3.) 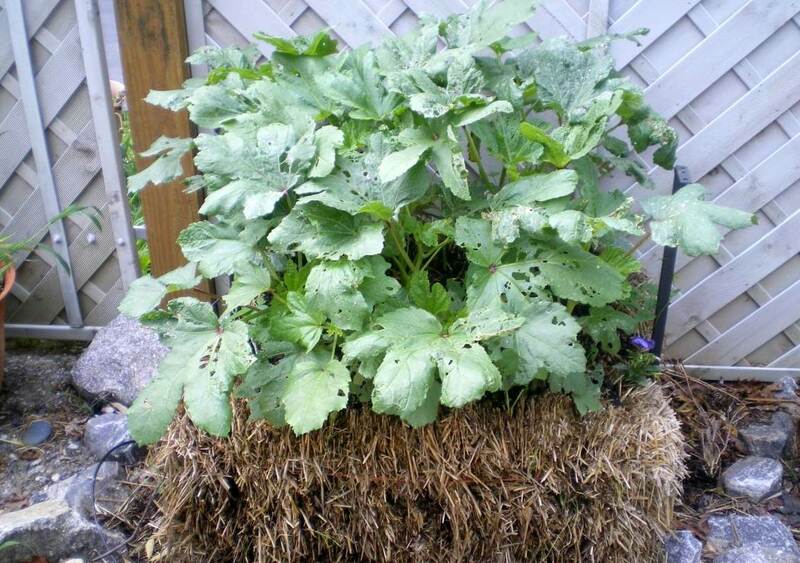 Plant the okra on the southern facing side of the house so they can withstand the colder northern spring.4.) Find you someone down south to ship you a bushel every month or so. I am so enjoying reading about your straw bale gardens! I am glad the okra is working out so well. I am curious if I can grow okra in my zone…will have to try it out next year!